I cannot stress how awesome the first season of YouTube’s Cobra Kai is! Showing us the aftermath of Johnny Lawrence’s life after losing the All-Valley Karate Championship wasn’t something I really was interested in (especially after a 34 year absence), but damn if it didn’t make a fine TV show that had the right about of nostalgia, pitch-perfect writing, and an outstanding performance from both Ralph Macchio and William Zabka (who in a perfect world would get an Emmy nomination at least). Season One ended with Cobra Kai winning the championship, but Johnny realizing that perhaps his way of “Strike Hard, Strike First, No Mercy” probably isn’t the best course of action as he’s created a monster he couldn’t foresee, and then his mentor and original Karate Kid supervillain John Kreese (Martin Kove) returns, opens the door for the possibilities for Season Two. With YouTube Premium going away, fans will no longer have to shell out a monthly subscription fee for the second season of Cobra Kai, so as long as you can stomach some advertisements, you owe it to yourself to watch this show. 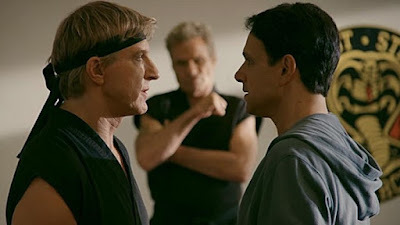 Cobra Kai Season Two lands April 24th on YouTube.